Summary: It was a week of attacking some big areas that need lots of work. Baw and Lek spent most of the week on the port sugar‑scoop, which needs the most attention, while Chai worked on the starboard sugar‑scoop. Both needed a lot of fairing of the outside walls to blend them into Ocelot's hulls. Luk's men came and told us to mount the pads for the stern rails, and then the walls could be finished. When the walls are finished, they'll come back to weld up the rails in situ. 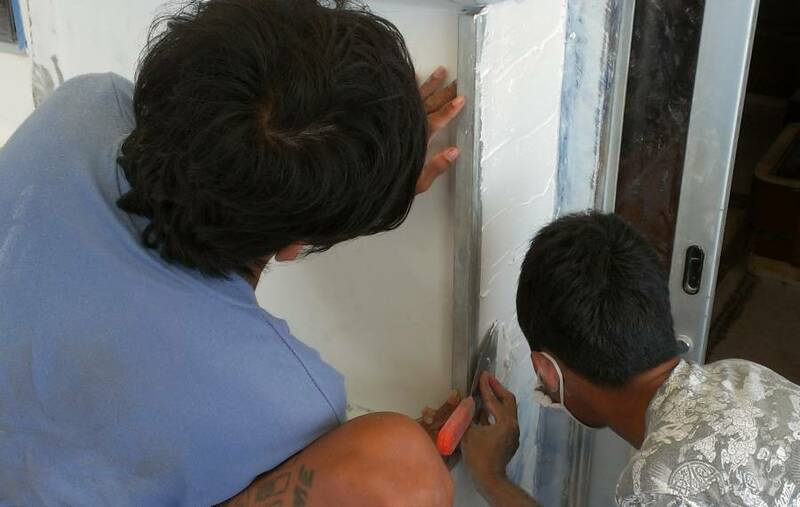 Nut worked on the many walls around the entryway, an area that was completely rebuilt so needs a lot of cosmetic work. Bank struggled with the aft cockpit seat but hasn't made much progress. 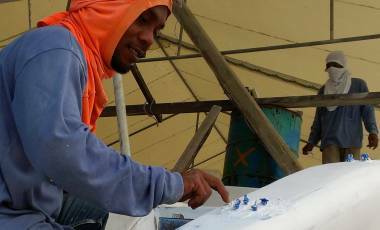 Song started the week working on the foredeck but couldn't take direction so he has left the team. We've been promised 2 replacements but they haven't shown up yet. Houa finished his work in the galley and moved to other salon projects, replacing: some floor supports, the top step to the starboard hull, the access door for a salon storage area, and the teak board under our front window. Houa also sliced a slot into the bolt‑rope holders on 3 sides of the bimini. The slots were then sanded smooth and the bimini was moved out in front of Ocelot so some soft gelcoat could be removed. The holes in the cabin‑top where the bimini supports used to come down were filled, glassed, sanded, and covered in filler. 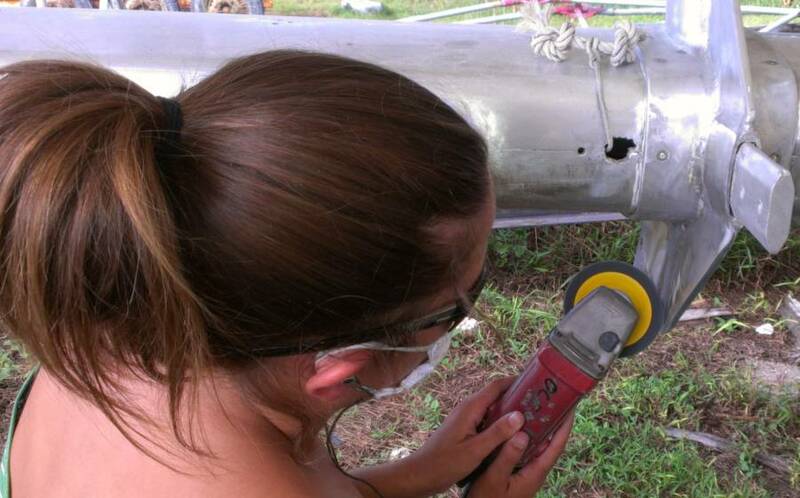 The 2 diesel and 2 water fill holes were drilled out and sealed with epoxy. Sue continued working on many small projects, overseeing the team, photography, and the projects finances. 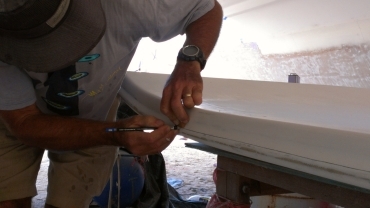 Jon used our laser to draw in the antifouling paint line on both sides of both sugar‑scoops so the polyester filler could be removed below that line. 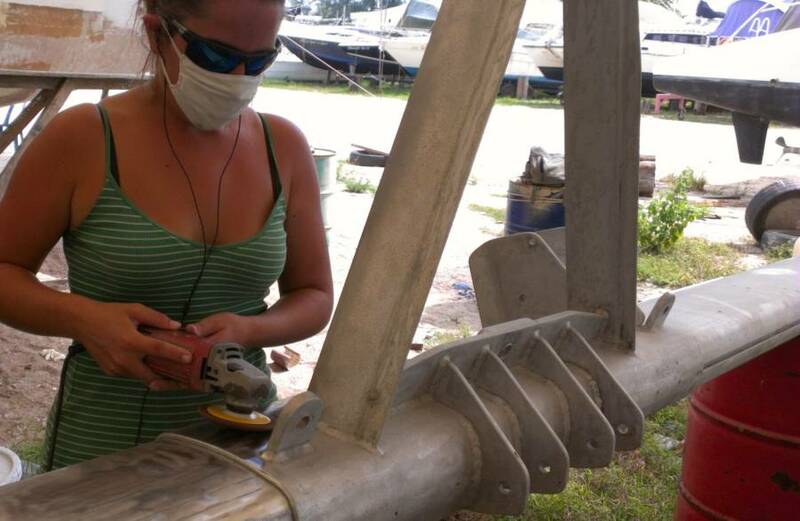 Amanda continued polishing our spars, and finished our new prod. We threw the workers a beer and chips party Saturday afternoon, and gave Baw a raise because of his dedication to Ocelot's rebuilding. Another beautiful day in paradise! A warm breeze from the east kept things on the cooler side of stifling hot, and the Ocelot tent was abuzz with sanders and Thai music and chatter among our 7 workers. Jon bought the guys some more 60 grit sandpaper in the morning. We think they must eat it or something, as we're buying them at least 30' (10m) of 1' (30cm) wide sandpaper every week! Then Jon went off in search of Bangkok Hardware, probably the best hardware store on Phuket (he found it on his third try). 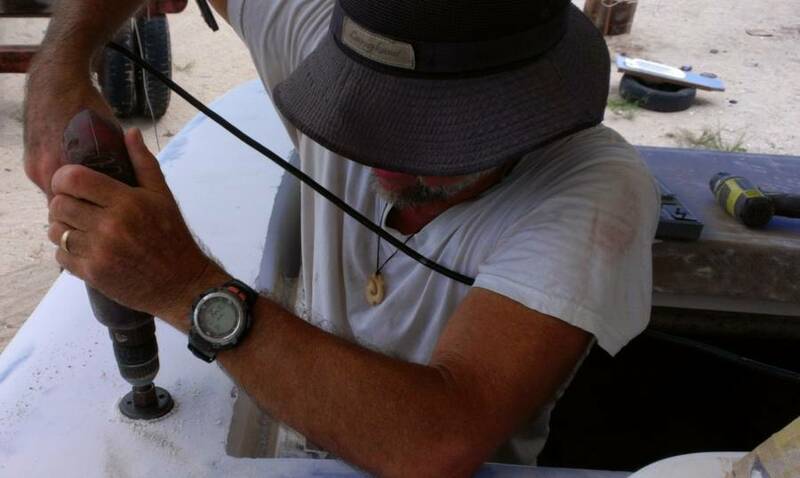 He was looking for a hole‑saw with enough reach to go through the bottom of our hull, and tough enough to grind through our old aluminum rudder‑bearing holder. We've redesigned our rudder bearings, making them both taller (4" or 10cm) and larger diameter (2" or 50mm bearing surface, 3" or 70mm OD for the bearing itself). This means that we've got to remove the old bearings, which are, of course, very firmly embedded in our hulls. That's where the hole‑saw comes in. Amanda and Jon traded off for much of the day polishing the base of the mast (the part that will be in our faces when the mast is stepped!) and the forebeam. Amanda even finished polishing the prod! Sue put in some time with sandpaper and tender fingers taking that polished look to burnished. Sue also chipped a lot of old epoxy blobs off the decks and out of drainage gutters here and there. In the afternoon, Jon got the 4 fill holes - 2 aft for diesel and 2 forward for water - drilled out of the deck. By getting the holes opened now we'll be able to have gelcoat sprayed down into the interior to protect the coring. There was a scary moment when we realized that dull hole saws actually cause enough friction heat to get the balsa core to smoke! Yikes! Nut worked on the details of the companionway, which is almost finished now. He had a few "nit noi" (little) places to put in "nit noi" filler to make the walls smooth and flat. He seems quietly competent. Bank needed some help on the back wall of the aft cockpit seat. We've been a bit frustrated with his apparently slow progress, as he's been working on the back of the cockpit seat for over a week now, and it's only about 8'x2' (2.5mx0.6m). It's a big vertical surface that comes down to the rebuilt aft deck and has rounded edges all around, so perhaps not as simple as it looks, but we think Bank isn't competent enough to work by himself. Throughout the day Sue, Houa, Jon and Baw all consulted on what needs to happen next. Tomorrow we have a mini conference planned with Houa and Cris/Num to translate, on what to do with the rebuilt and uneven aft deck itself, which will get both teak and gelcoat (trim). Houa laminated a piece of marine ply with a teak veneer, ready to place in the front of the salon, under the main window. This teak died long ago from the undesired ingress of water. Houa also prepped the corner salon area to receive a new access hatch, so that we can get to things in the deep corner seat. Sue convinced him that beautiful is not necessary, because no one will see it! Well, except her, and she's happy with functional at this point. Song put what we hope is the final filler on the starboard cabin top where the old teak handrail was. The "rebuild" once the handrail was taken out was indented, so we've had to build it up with filler. Another buzzing day on Ocelot. Only 4½ of E‑U's men today - not sure what happened to Pooton. Houa made the most visible progress. In the process of digging into the floor of the salon back in mid‑March, Houa opened up a corner area under the salon seats that had never had access before. Now he's finally getting around to building a removable cover for that seat. This will give us access to that area (which is a major wiring area) as well as another storage area. 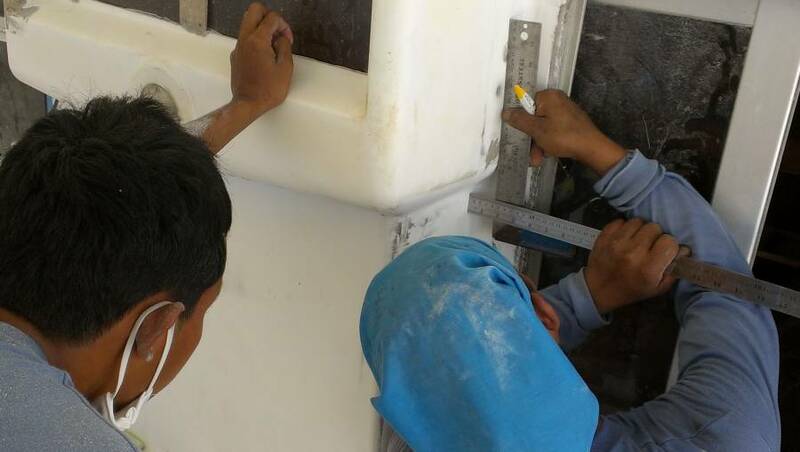 Houa is also working on a teak‑faced plank to go under our forward window. He got the teak facing veneer put on, painted epoxy sealer on the bottom, and hopes to mount it in place soon. Not everything is progressing happily here. We learned today that Bewn, one of our previous employees, broke into Houa's locked tool cabinet last week and stole a couple of grinders (and possibly other tools as well). Everyone seems to know who did it and where he lives. Apparently E‑U is going to have a talk to him. OK, we'll let the Thais handle this the Thai way. Also, Sue was working on the gutters for the chain‑lockers when she noticed Song about to smear some filler into one of them, but he hadn't cleaned it first. She asked him to please clean it first with acetone. Song apparently took offense and left the yard. He'll probably be back at work tomorrow, but this is not the first time he's done this. Song's a reasonable worker but seems to have an attitude problem. He prefers to work alone and he never seems to smile at us, no matter how much appreciation we give him (which the Thais may see as a sign of weakness). Not sure how to handle this, but we'll probably take him to Cris, the yard manager, and ask him to explain his actions. If he doesn't want to work for us, we can probably find others who do. There's not much work happening at the yard right now. Chai and Baw and Lek made more progress on the sugar‑scoops. One problem is that the walls coming down to the swim‑platform have a large‑radius curve at the top (where they meet the deck) but a much smaller radius curve at the bottom, by the swim‑platform. The transition from large‑radius to small‑radius has to happen gently over the entire 12' (3.5m) length of the wall, a very difficult task. But they're taking it very seriously, and seem to be doing an excellent job. In the companionway area, Nut carried on with his filler and sanding. He understands that we want only minimal filler, so he's constantly checking his surfaces with a straight‑edge, and only filling where necessary. But with all the repairs that were done around the entryway, he's needing a fair amount of filler, and lots of sanding. There are so many surfaces to do, it's hard to keep track of what he's done and what he still has to do. We think it's going to beautiful, though! Back on the back of the aft cockit seat, Bank took a new tack today. He went for the Thai way, which is to filler the heck out of the space, then sand it back smooth. Who knows. This may work well on this big, smooth, unblemished area. So Jon marked out where the cuts should go on the edges of the bimini. This will put long slits in the captive PVC pipe that will become the holder for the bolt rope for a dodger (in the front) and shade awnings (on the sides). Amanda continued sanding the mast and the forebeam, making good progress. Luck Engineering dropped off our newly polished swim‑ladders and our newly welded boom, but they still don't know when they can come to finish the railings down to the swim‑platforms. Nut grinding off a sharp edge of fiberglass under the "eyebrows"
A really good middle of the week day today! Sun behind clouds, but no rain, so a bit cooler. Sue arrived at the boat early as usual, and was able to direct the guys to tackle some small but needed jobs. We think we're finally getting the knack of managing the team! We asked Houa to please slice the bolt rope slots in the bimini, as we want to have our end of the bimini job done as soon as possible. He used a grinder to follow the lines Jon put down yesterday, and within an hour he had all 3 sides done! Next step is to create a sanding tool with a rod (or pencil) inside sand paper so that we can smooth the sharp edges of the slots. Houa also worked on the strip of wood to go under our forward window in the salon, chopping out some more wood that will be replaced with his piece. He should be able to glue it in tomorrow! Up on deck, Chai asked Nut to do some nasty fiberglass grinding for us. Nut set up the big yellow extraction fan to blow the grindings away from him, and cut back the gelcoat and a bit of fiberglass around the 2 holes in the spines on the cabin top, where our old bimini supports used to come down. Since we don't need them now, it's time to close them up. Nut filled the two deck holes with polyester filler which he was able to sand flat after 10 minutes. Houa mixed a small batch of epoxy, and Nut and Sue glassed over the holes. Now the glass needs to be sanded smooth and covered with gelcoat to hide that there were ever holes there. While still in grinding mode, Nut crouched down on the new foredeck area and got the sharp, rough edges of glass smoothed back under the "eyebrow." 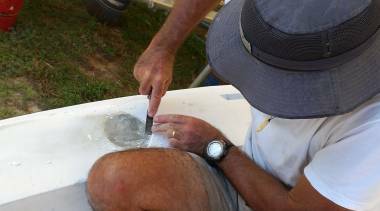 Then he used his extra epoxy and epoxy filler to seal the edges of the 2 diesel fills on the aft deck and the 2 water fills on the bow. 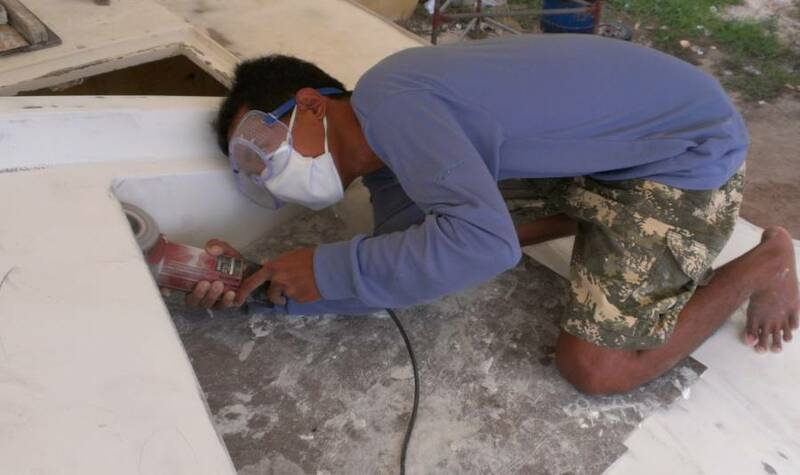 After his epoxy work, Nut went back to working on the companionway. We were thinking it was almost done when he ran his leveler along the wall to the starboard side of the helm station (an area that was completely rebuilt). What he found definitely needs more filler, so there we go again. Our (happy) surprise was that the 2 stainless steel workers from Luck Engineering arrived in the morning! While they worked on the ground under Ocelot to cut off the 4 pads from each spoiled grab‑rail, Jon and Sue worked on the sugar‑scoops to uncover, clean up, and mark the 8 circles of reinforced glass that will hold the bolts for the new railings. Baw had covered the portside pads in tape so our old marks were still intact, but on starboard we had to chisel a lot of filler away so we could see the color transition from solid glass to glass/foam, which marked the edges of the reinforced patches. After much discussion (and translation help from Houa, whose English is improving wonderfully) it was decided that Luck's men would cut off the mounting pads from the old rails and we would mount just the pads on the reinforced patches. Once the bolt holes were drilled and tapped into the fiberglass reinforcement patches, the pads would be removed and the tops of the bolts wrapped in tape to protect them before being run back into their holes (up to the tape). Then Baw and Chai could cover the reinforced patches in filler and smooth them to their final shapes, with the bolts preserving the holes. Once the walls are the right shape, we'll call Luck back and they can create the new railings, connecting them directly to the pads as they're bolted down. The final sprayed gelcoat won't affect the mounting locations enough to worry about. Baw and Lek look like they're on the final stretch to make our port extension beautiful. Chai continued his work on starboard. Bank was still, yes, still, on the aft seat wall. This afternoon we were finally able to talk with E‑U and Num about having him work elsewhere on the boat, or maybe along with someone like Baw and let the more experienced Lek take a shot at flattening the aft deck wall. After that we saw Baw helping Bank sand the back of the cockpit seat, which isn't quite what we were looking for. We wanted Bank to move over and start helping Baw, not have Baw leaving the sugar‑scoop to help Bank, but perhaps it's a step in the right direction. We also learned that Song (who never showed up today) will be replaced by another good quality worker. A frisky breeze from the NE kept things cooler, but it also lifted a lot of polyester filler dust from the boat into the air. Face masks!! We learned yesterday that a yard worker (not one of ours) had died of liver failure (too much alcohol) and there was a funeral today. We offered the guys time off, and some chose to work half day or not at all. Sue found the yard strangely quiet this morning, and we ended up with only Houa, Baw and Nut. Presumably the rest of the crowd will be there tomorrow. Houa worked on the forward teak shelf, fitting it to shape. He and Sue also discovered that yesterday's epoxy (that he mixed) didn't cure properly, so he offered to grind it off. On the companionway Nut was getting closer to filling the big hollow by the helm station. Sue spent time cleaning up the gutters of the anchor lockers, and then vacuuming out the lockers themselves and the new tank lockers on the foredeck. It's amazing how much mess/damage can be done when the contractor and workers sort of ignore the areas surrounding and below where they work. In an ideal world these areas would have been well taped and sealed off. Well, they were, and then they weren't, and by then the mess was made. Dust, epoxy drips, polyester drips, more dust, sandpaper tidbits, yuck! Baw moved from port extension to the starboard side where Chai had been working, and he was adding filler to the flat area above the waterline. 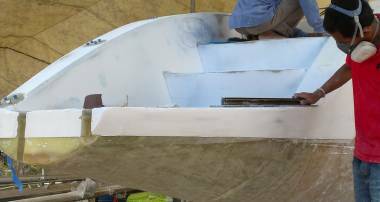 This is putting a fair amount of filler on the outside hulls of Ocelot, but the alternatives are to put glass over the filler (a long, expensive job needing fairing and filling again afterwards) or to leave the hull slightly off kilter. Jon and Amanda set the last of the bolts on port side extension wall where the handrail will come down, so that side can now be finished. We talked to Baw so he knows he can now put filler on the reinforcement pads. The bolts (with tape on the tops) will keep the holes clear. Then the bolts can be removed and the walls sanded smooth. 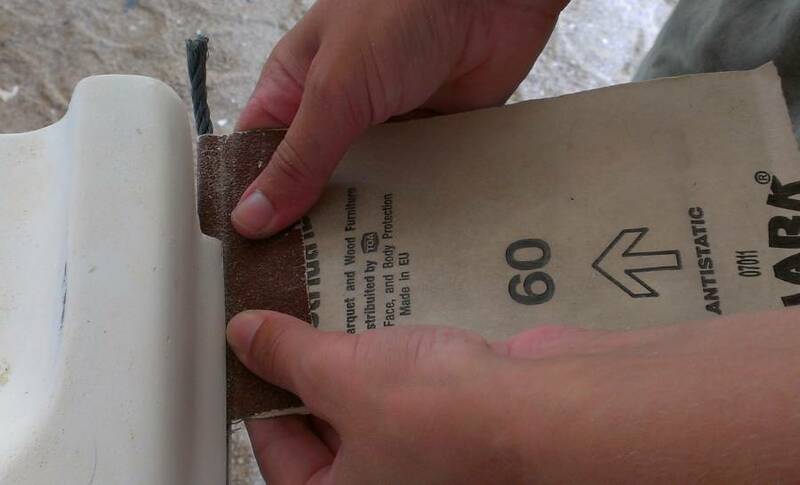 Jon and Amanda also created sandpaper "bolt ropes" by wrapping 60 grit sandpaper around bits of small rope. They worked these in at the corners of the bimini, just as we will one day put in awnings and the dodger. With this hand made tool they were able to sand the insides and edges of the slots cut by Houa yesterday. We'll probably have to repeat it again after the gelcoat is sprayed on, but at least we know it's doable. But with so few workers around, and those some of our best, who can work without direction, we decided that this would be a good day to do some Christmas shopping. So the 3 of us left the yard, picked up Amanda's buddy Rachel, and caught a local bus up to one of the local malls for some "retail therapy". A typical hot Thai December day, with the strange visions of Christmas lights and Santas in the shops. Nothing very Christmasy at the yard, though. Hard to believe it's almost the end of a week. Guess a half day off yesterday has shortened the feel of the week! It was great to see Baw moving to new areas on the port extension today. He worked on the step edges, the "floor" of the extension, and the inside wall of the hull. He wants to spray Thai gelcoat (the cheap stuff) on the outside hull of port side to check that the curve is accurate. We checked with our consulting contractors, Wiwat and Mike, and got the OK for a gelcoat spray job. Mike said they might even want to polish it a bit to bring out the shine, and thereby be able to check the curves. So that's in the offing next week. In the course of filling and fairing the sugar‑scoops, the guys have been putting (polyester) filler below our waterline. We've told them that we only want epoxy below the waterline, and if they want filler then they must use phenolic (dark red) micro‑balloons, which don't absorb water. But it occurred to us that the guys probably don't know where Ocelot's waterline will be. So Sue dug the laser out of our storage unit and Jon set it up and used it to mark out the antifouling paint‑line (3" or 75mm above where we think the waterline will be). Once they knew where the line was, Jon and Baw scraped off the new filler below the waterline. Chai hadn't put much filler on his side but he put tape down on the line so he could peel up the filler after he smeared it on. It's fun to see where the line will be now! The outsides of both sugar‑scoops have well‑cured filler below the waterline, which will have to be ground off sometime soon. Chai continued working on the starboard extension, and Lek worked alongside him. Chai was able to get filler in and around the handrail bolts. Then he carefully took them out, sanded the filler smooth, and replaced the tape wrapped bolts. Lek put filler on the edges and aft sides of the steps, and they both did lots of checking and sanding. Bank spent a bit of time on the top of the aft seat, then moved over to help Nut on the companionway area. After his slow progress on the aft cockpit seat, we were happy to see Bank working well with the complicated angles of the companionway. Amanda took the day off to go "play" in Phuket town with her buddy Rachel. Actually it was a secret Christmas shopping trip, and we're not supposed to know anything about it. Sue spent time in breath mask (as she was downwind of the sanding) brightening up the mast with 400 grit sandpaper and water. It's a nice cool job now that most of the mast is in the shade. Back in mid‑March, when they ripped out a section of the salon floor, they also removed the top step that goes down into the starboard hull. Today Houa make great strides replacing that top step, getting it the right height and interfacing it with the new fiberglass and foam floor that Max put in to replace our old damaged plywood floor. 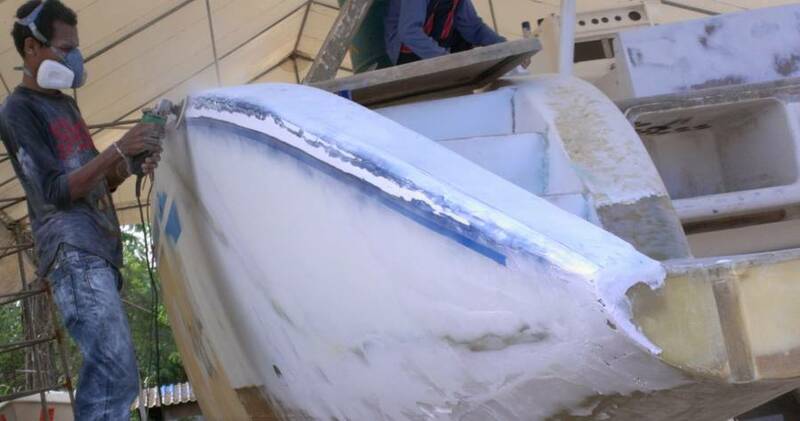 Our new bimini has been under Ocelot, but it's a bit in the way there, and it needs to get sprayed with gelcoat. So Jon rounded up some guys and moved it out in front of Ocelot, under the new shade that he put up last week. Since the bottom is all nicely prepped, they flipped it right side up so the top could be prepped. Unfortunately, Jon found that some of the gelcoat on the top hadn't cured correctly, so he's going to have to attack some places with acetone and a wire brush. A cooler, breezy, overcast day, so the guys were working well! 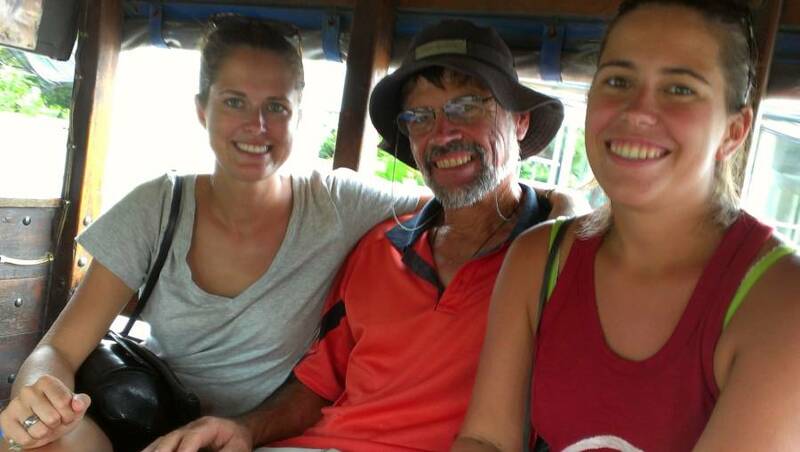 It was a busy end of the week sort of day, with 4 of E‑U's team on board and Jon holding down the fort while Amanda and Sue took the scooter into Phuket town for some much needed Christmas shopping. Baw put his attention to the detail of the port steps, sanding the corners and putting beautifully smoothed filets of filler in the corners. Baw is doing an amazing job which we really appreciate. So today Jon took him up to Cris, the yard manager (who speaks good English) and made sure he knew. We told him that we appreciate the personal responsibility he's taking, how he makes sure everyone is doing their work correctly, and how he helps folks who are having problems. Then we told him that as of next week, he's getting a 12% raise in pay (to $29/day). Nut and Bank worked together on the crazy walls around the companionway. It's easy to think "that could have been done in a couple days" but in truth it has taken a lot of filling and checking and re‑filling. It's one of the areas on Ocelot that was completely torn apart and rebuilt, so it's understandable that the walls are not parallel or flat. 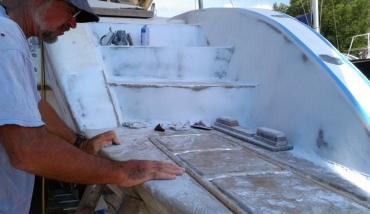 Nut also smoothed the fiberglass that was laid on the cabintop yesterday, and covered the patches in filler. 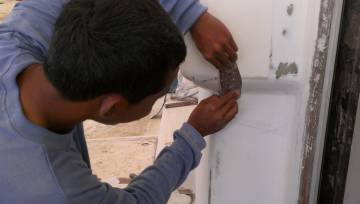 Houa worked on the threshold over the starboard steps inside Ocelot, and was taking measurements and working out the way to repair the floor right there by the companionway and nav‑table. When Sue and Amanda weren't gallivanting around Phuket on Scooter, they worked on shaping the hatch coamings up on the cabin top. These old coamings were made in the mold when Ocelot was built, and they are very steep‑sided - too much so for the new gelcoat. So, they experimented with hand and block sanding, and finally got a nice rounded curve on the edges so that the new gelcoat won't get knocked off or cracked very easily if something is dropped on the them. We absolutely do NOT want any filler put up there. The old cabin top deck is perfect enough, thank you very much. Since this is the end of the work week, and in keeping with the holiday season, we threw our guys a beer and chips party after work. We used to do this every week, and we think the guys just came to expect it, so it didn't mean anything. This one was certainly appreciated!